Harvard in Allston, now (above) and in development (left). The figure at left shows existing uses, such as the athletic facilities (the Stadium is the blue U) and the Business School campus. Orange and blue blocks are projects authorized by the Institutional Master Plan. 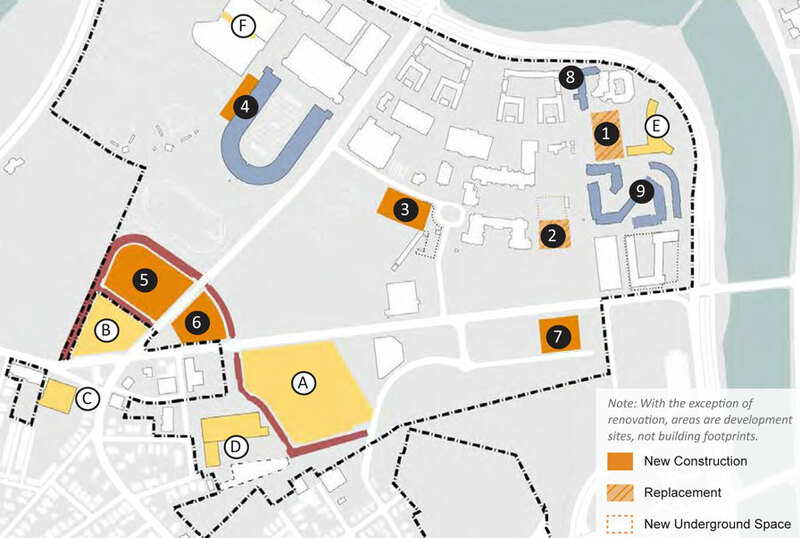 Yellow blocks, previously approved, include the science center (the large quadrilateral). Allston imagined: the schematic indicating potential building along Western Avenue and filling the enterprise research campus (lower right). Following approval  of the University’s Institutional Master Plan  (IMP) by the Boston Redevelopment Authority last October, the work of envisioning much larger, longer-term academic and commercial growth on Harvard’s Allston properties has now begun. President Drew Faust signaled the news in a low-key e-mail, titled “Allston Update,” just before the December holiday break. It announced that provost Alan Garber and executive vice president Katie Lapp would direct three committees charged with advising on “the creation or relocation” of academic facilities; planning “a community of commercial and nonprofit” entities in an “enterprise research campus”; and consolidating these ideas and putting them into a University, regulatory, and financing context. Harvard’s aspirations for Allston have come in waves. Ambitious plans early in the previous decade for a multimillion-square-foot research campus, perhaps with new undergraduate Houses, fell to financial realities. Construction on one large laboratory complex halted in 2010, when the University felt unable to incur more debt (at least several hundred million dollars) to complete it. Now reenvisioned as a home for much of the School of Engineering and Applied Sciences (SEAS), the building is a major capital-campaign priority; work is under way to redesign the site and proceed to completion soon. Construction has also begun on Barry’s Corner: residential and retail buildings at the northwest corner of the Western Avenue-North Harvard Street intersection. Other projects are under way (renovation of the hockey arena) or just completed (Tata Hall, the new executive-education residence at Harvard Business School—HBS). The committees “formalize a structure for the next phase of planning for Allston,” said Provost Garber during a mid January conversation—beginning the process of “thinking hard about what else will go into Allston” for academic and other facilities as the area develops. Allston has been part of his agenda continuously, he noted. The new committees had begun to take shape even before approval of the IMP. Their unveiling, he said, formally starts long-range planning beyond the IMP, and in effect reboots the larger process of thinking about Allston. Identifying those fields involves judgments about how research will evolve in the next decade to 15 years, he indicated—a process in which the views of the Harvard community will be solicited. To that end, the committee members are drawn from most Harvard schools—including SEAS, on a growth trajectory, and the Graduate School of Design, which is out of space in Gund Hall. 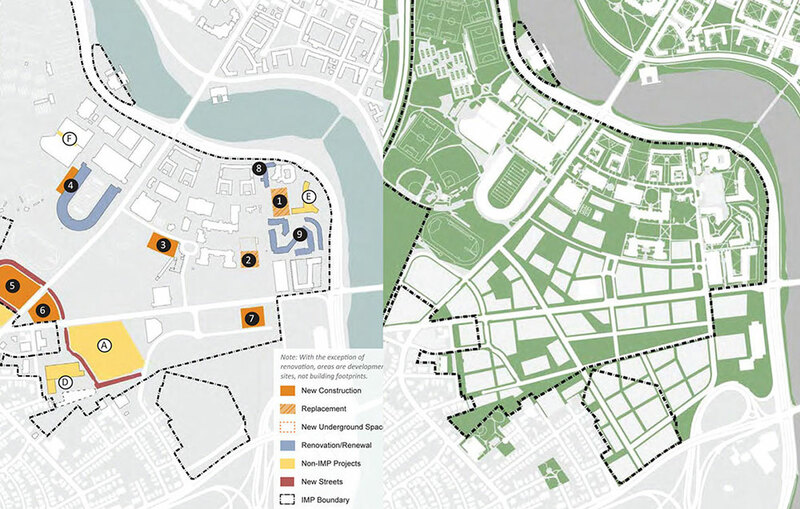 Members will help winnow the focal fields for Allston, consider faculty and student space needs, investigate how to pay for the plans, and see where these fit in Allston overall: a major role in shaping Harvard’s future. Asked whether the committees’ creation signals anything about the pace of the Harvard Campaign and ambitions to accelerate the Allston timetable, Garber observed only that philanthropy and external economic conditions (such as endowment returns) were unpredictable—but having plans in place would enable Harvard to move quickly if the means become available. That planning committee, co-chaired by Lapp and Rick McCullough, vice provost for research, includes faculty members versed in real estate and economic development, and administrators responsible for technology licensing and campus planning and construction. They have been charged to think “expansively,” Garber said. Given Boston’s process for negotiating taller, denser development than Cambridge permits, the resulting facilities, in toto, could represent a big investment (presumably led by private investors, on terms to be discussed). He emphasized that no one envisions a biotech or IT park per se: the uses will emerge with discovery and might embrace fields of research, as yet unknown, with commercial potential. Much planning, permitting, and infrastructure investment must precede construction, but the torrid pace of building in Kendall Square and on the Boston waterfront makes it attractive to prepare the site, should developers’ appetite extend westward. The academic and enterprise groups will exist for a few years at least, Garber suggested, assisted where necessary by support staff and consultants. They report to a steering committee. Garber is chair, joined by Lapp; the deans of law, design, SEAS, HBS, and the Faculty of Arts and Sciences (FAS); a professor of urban planning who has completed significant assignments in Boston (including the master plan for the Seaport innovation district); and administrators—significantly including Harvard’s senior development, government relations, and financial officers. They are responsible, he said, for “Allston development from a holistic perspective”: how pieces fit together, design, financing, and permitting. The steering committee will coordinate its work with the detailed planning and capital-budgeting functions managed by Katie Lapp, and with the schools, and issue recommendations to Faust. The Corporation’s finance and capital-planning committees will also weigh in, before the governing board decides to authorize development projects.